For more than four decades, Canadian author Alice Munro has delighted readers with her engaging storytelling and profound “slice of life” narratives. Now, the Royal Canadian Mint proudly celebrates this Nobel Prize-winning author with a unique coin that honours Munro’s literary contributions—both at home and worldwide. 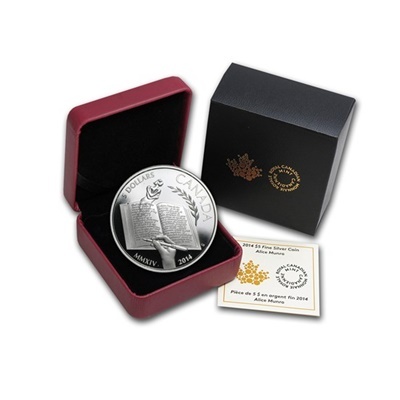 The coin is engraved in exquisite detail and the coin celebrates one of Canada’s most celebrated authors and her literary achievements. The coins features a passage chosen by Alice Munro herself from one of her short stories, titled The View from Castle Rock. The author explains its significance and her thoughts as she wrote it: “As a writer you need to be alone. You need to get to a place of solitude and when you get there it can be magical. The whole world opens up to you in your imagination merging the world inside of you and outside of you.” Stunning use of micro-text – uses advanced engraving techniques so that you can view the words of Alice Munro crystal clear using a magnifying glass. The coin is encapsulated and presented in a Royal Canadian Mint-branded maroon clamshell with black beauty box.